: крем — 249 р., таблетки — 857 р. Average price online * : cream - 249 p., Tablets - 857 p.
"Exifin" - a drug manufactured in India, manufactured by the pharmaceutical company "Dr. Reddy´s Laboratories Ltd. "
The tool is used to treat fungal infections of the skin , nails and mucous membranes caused by the growth and activity of molds, yeast fungi or dermatophytes. The drug is often prescribed to patients for the treatment of systemic mycoses, since even in low concentrations it effectively copes with the pathogenic fungal flora. The active ingredient "Exifina" (terbinafine) blocks the production of ergosterol - the main component of the cell membranes of most species of fungal organisms. This allows not only to prevent further growth of the pathogenic flora, but also to destroy the fungus at the cellular level. white round tablets for internal administration of 16, 20, 28 or 40 pieces per pack. One tablet "Exifina" contains 250 mg of active ingredient. The drug is used to treat fungal infections and other lesions caused by the spread and growth of pathogenic organisms (fungi). other fungal infections of the beard and scalp (hairy part). infections of smooth skin (fungal). Important! The use of tablets "Exifin" for the treatment of multi-colored lichen, caused by Malassezia furfur, will not bring results. For these purposes, only local use of the drug can be used. 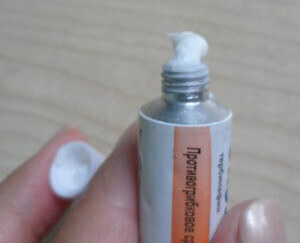 The cream should be applied to the affected areas as well as the surrounding area. Before the application procedure, a hygienic toilet of the sore spot should be carried out, the surface should be antiseptic and dried. The duration of use, as well as the number of applications depends on the diagnosis and localization of the pathogenic process. Important! When using the cream in areas of excessive sweating (the space between the buttocks, under the breast, between the fingers, etc. ), it is recommended to use medical dressings for the night. Adult patients . The standard dose for treating mycoses in adults is 250 mg. Tablets must be taken orally. Absorption of the drug is not associated with food intake. "Exifin" is taken once a day. Patients with liver and kidney disease require dose adjustment - as a rule, it is reduced by half. more than 40 kg (1 tablet). vascular pathology of the extremities. 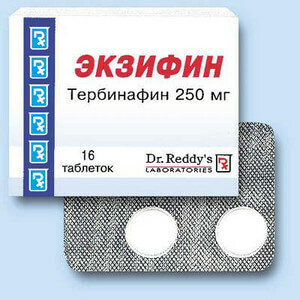 "Ekzifin" in the form of tablets is prohibited to use during pregnancy and lactation in connection with the teratogenic effect on the fetus. In the presence of strict indications it is allowed to use the drug in the form of a cream. Conducted studies have shown that with local use, terbinafine does not have a toxic effect on the organs and systems of the fetus. Lactation is not a contraindication to the use of cream, because terbinafine is absorbed into breast milk in very small concentrations that can not harm the body of a newborn or infant. With local application of "Exifina", irritation may appear, as well as burning and itching of medium intensity, which disappear in 5-15 minutes. Important! If undesirable effects occur when taking Exifina, you should seek medical help. After ingestion, terbinafine is rapidly absorbed and accumulates in the skin, tissues, dermis, and nails. The concentration required to ensure the fungicidal effect is achieved after several weeks of use. The active substance is metabolized in the liver, the bond with plasma proteins is 98 percent. Excreted from the body mainly with urine (80%), the rest - with feces. The cream is available without a prescription, pills - by prescription. The drug should be stored at temperatures up to 25 degrees. Shelf life - 3 years from the date of production.